We deal in exclusive range of Digital Sling Phychrometer 8736/8746 which is known for high quality and durability. These are available in a huge number of variety that are creatively designed by our team of diligent designers. As a leading Digital Sling Phychrometer 8736/8746 importer, we have been fabricated our assortment of thermometers as per the modern market requirements. Besides the full functions and features of model 8726 , one additional K Type(8736) and two additional K Type(8746) interchangeable probe for an extended temperature range up to -200~1370ºC is added . 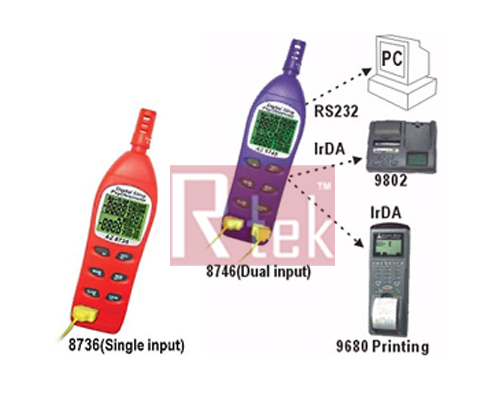 RS232 interface for online logging data . 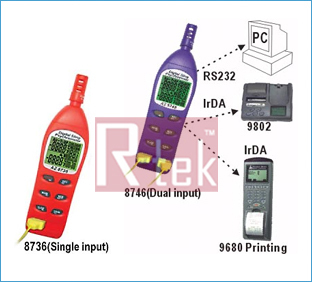 Also enable the user to recall and print wireless via Infrared output to the optional printer (VZ9802AZ - the IrDA data logger printer) for HACCP documentation repaired . Using Rotronic capacitor humidity sensor for the accurate reading ,condensation will not affect meters' accuracy .